Avion Pharmaceuticals is extending a special instant savings offer for patients. Most patients pay no more than $30 per fill. That translates to up to $60 off per fill, for up to 12 uses. 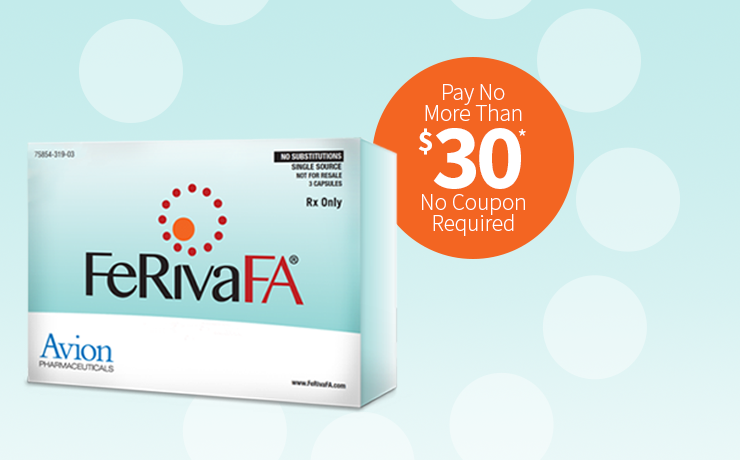 FeRivaFA® delivers three preferred forms of iron for three times the benefit. FeRivaFA®’s balanced ingredients help aid iron absorption while providing additional nutritional benefits. with the smarter iron to help sustain healthy levels of iron. FeRivaFA® is an iron supplement that contains three forms of iron, including ferrous asparto glycinate (Sumalate®), the latest targeted iron to help improve tolerability and compliance. 1. Kamdi SP, Palkar PJ. Efficacy and safety of ferrous asparto glycinate in the management of iron deficiency anaemia in pregnant women. J Obstet Gynaecol. 2014; Early Online: 1–5. doi:10.3109/01443615.2014.930098. Accessed December 29, 2014. 2. Data on File. Avion Pharmaceuticals LLC, Alpharetta, GA. 3. Bovell-Benjamin AC, Viteri FE, and Allen LH. Iron absorption from ferrous bisglycinate and ferric trisglycinate in whole maize is regulated by iron status. Am J Clin Nutr. 2000; 71:1563–1569. 4. Pineda O, Ashmead HD, Perez JM, Lemus CP. Effectiveness of iron amino acid chelate on the treatment of iron deficiency anemia in adolescents. J App Nutr. 1994; 46(1,2):2-13. 5. Ashmead, HD., Archivos Latinoamericanos de Nutricion, Vol 51, No. 1, 2001, (Albion Laboratories, Inc.). 6. Szarfarc SC, Núñez de Cassana LM, Fujimori E, Guerra-Shinohara EM, de ‘Oliveira IMEV. Relative effectiveness of iron bis-glycinate chelate (Ferrochel) and ferrous sulfate in the control of iron deficiency in pregnant women. Arch Latin Nutr. 2001.